The building has been abandoned for over seven years. 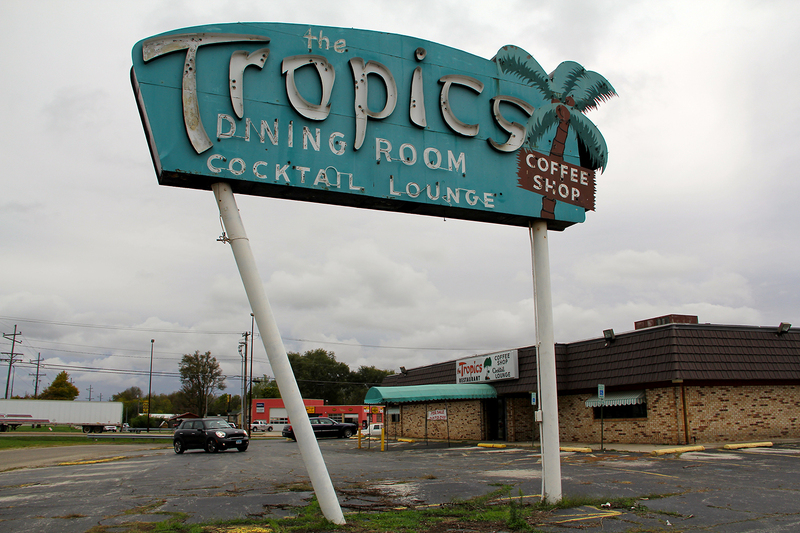 The Tropics used to be the area’s hottest tiki bar, built by a post-WWII vet who served double-pattied burgers, but the fad of the Atomic Era-inspired South Pacific craze quickly came and went and The Tropics went from a simple coffee shop/diner to a diner to closed. I enjoyed my only meal of meatloaf, mashed potatoes, and green beans there in 2001. The dining room was dimly lit and I was one of maybe four other tables, but because there was the hum of discussion going on, I felt welcomed and not so alone. However, over the years, fast food chains have taken away a lot of the business, and since the highway can move you directly and quickly from Bloomington, Illinois, to Springfield, Illinois, Lincoln slowly evaporated into merely a quick-stop for bathroom break or a snack. There isn’t much left to the town to visit except a giant Lincoln on the largest covered wagon in the world. The Verizon store behind The Tropics waits for customers. The parking of the Redwood Motel across the street is full, but I don’t know if these are the cars of people stopping overnight or of the people who permanently live there, like so many of the old mom-and-pop motels. The Redwood Motel, Lincoln, Illinois. I stayed at the Redwood Motel back in 2001. I remember many people walking by the window trying to peek inside. I put the recliner up against the door in case anyone wanted in as I slept. Again, I don’t know if the Redwood is still a nightly rental motel or if rooms are rented on a monthly basis, but I do know that while I was in Lincoln, The Tropics was the only place that made me feel welcomed and safe. Now, like everyone else, I’m just pushing south to Springfield.